2 areas of people’s lives where RCB strives to make the most difference are Health and Education. The Rotary TT Blood Bank , The Rotary Mutthappa Attavar Memorial Hospital, the Rotary Bangalore ICICI Prudential Dialysis Centre, Stem-Cell Registry are a few of the many major health initiatives of Rotary Club of Bangalore. It goes without saying that the Club is a front runner in Rotary’s fight to eradicate Polio. Now that it has been eradicated from India , RCB continues the vigilance and efforts regardless, to maintain this status. An array of ongoing health initiatives include Blood Donation Camps, Paedriatric Heart Surgeries, the limb –a-day programme and many more. Use Pictures and text from the RCB brochure). 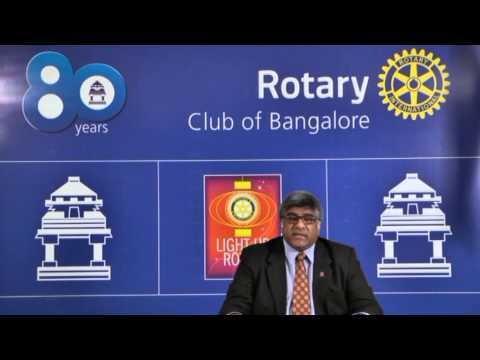 Rotary Club of Bangalore considers education for underprivileged boys and girls its moral duty to fulfill. Towards this it owns and manages its own High school, Rotary Bangalore Vidyalaya which educates around 500 boys and girls. Situated in Nagadevanahalli , Bangalore ,the spacious and fully equipped school with its experienced staff is a symbol of good education. Around 200 scholarships are also offered to poor students by the Menda and Hyagriv Education funds. Besides its own school RCB has built 20 Primary schools in Bangalore and 20 in the rural area of Malur , close to Bangalore. The Light-for-education project donates solar lamps to rural school going children. The project is also providing solar lighting to Government Girls Hostels in Karnataka. A very successful project,it has seen the attendance and academic results of students improve dramatically. Taking the Matching Grant and Global Grant route of Rotary International’s force multipliers, the club has increased its financial ability many fold to undertake bigger projects like constructing Toilet Blocks, donating ambulances and providing school infra structure.. Besides Health and Education, Rotary Club of Bangalore has expanded its scope of Community Service to now cover Rotary International’s 6 Areas of Focus. Impacting Five Hundred Lives Every Four Years!